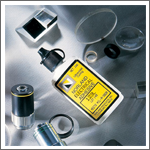 Single component adhesives that cure tack free in seconds to a tough, resilient polymer when exposed to ultraviolet light. Single component adhesives with that cures tack free in seconds to a tough, resilient polymer when exposed to ultraviolet light. Single component adhesive that cures tack free in seconds to a tough, resilient polymer when exposed to ultraviolet light. Low outgassing, one part, thixotropic adhesive similar to NEA 123. 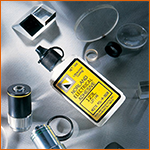 Single component, silver filled, conductive adhesive for preventing static build up and will cure tack free to a tough, resilient polymer when exposed to ultraviolet light and heat. Single component, red, solvent free adhesive that cures in minutes at high temperatures to form an electrically insulating polymer for bonding, sealing or potting of electronic components.